URANIUM is a very heavy radioactive metallic element. It contains 92 protons (hence atomic number = 92) and 92 electrons. The number of neutrons varies and so several isotopes are found. The nucleus is rather unstable and can split (nuclear fission).The roiling particles in the animation give the impression that the nucleus is only just holding together. 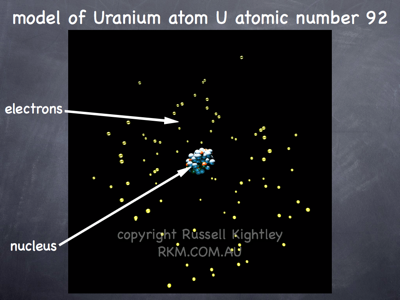 Uranium is important in nuclear power reactors and has been used in atomic bombs.